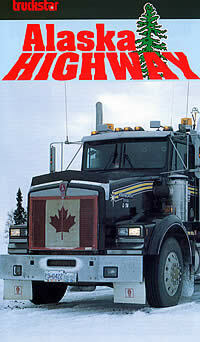 There are three strands to this exciting video 'Alaska Highway' filmed in 1998 in the Canadian North-west. Firstly, the highway itself, built through wilderness in 1942 as a military supply line when the American continent was threatened by the Japanese. This all-year route offers extreme conditions from temperatures 50 degrees Celsius below and freezing rain to mud and soft going. Keeping the highway open and safe are major operations. The main industry is forestry. Clear filming and informative interviews give insights into the exploitation and stewardship of the world's second largest forestry area. And there are some interesting machines in operation, including a 300hp Chieftain D LGP crawler. But the stars are the trucks and the truckers, owner-operators working under pressure for timber haulage, wood products or the oil industry. Their professionalism is clear, enabling them to keep the life-line of transport flowing in often highly adverse conditions.